The latest organ-on-a-chip from Harvard’s Wyss Institute for Biologically Inspired Engineering reproduces the structure, functions and cellular make-up of bone marrow, a complex tissue that until now could only be studied intact in living animals, Institute researchers report in the May 4, 2014, online issue of Nature Methods. The device, dubbed “bone marrow-on-a-chip,” gives scientists a much-needed new tool to test the effects of new drugs and toxic agents on whole bone marrow. This is a microscopic view of the engineered bone with an opening exposing the internal trabecular bony network, overlaid with colored images of blood cells and a supportive vascular network that fill the open spaces in the bone marrow-on-a-chip. Specifically, the device could be used to develop safe and effective strategies to prevent or treat radiation’s lethal effects on bone marrow without resorting to animal testing, a challenge being pursued at the Institute with funding from the U.S. Food and Drug Administration (FDA). In an initial test, the engineered bone marrow, like human marrow, withered in response to radiation unless a drug known to prevent radiation poisoning was present. “Bone marrow is an incredibly complex organ that is responsible for producing all of the blood cell types in our body, and our bone marrow chips are able to recapitulate this complexity in its entirety and maintain it in a functional form in vitro,” said Don Ingber, M.D., Ph.D., Founding Director of the Wyss Institute, Judah Folkman Professor of Vascular Biology at Harvard Medical School and Boston Children’s Hospital, Professor of Bioengineering at the Harvard School of Engineering and Applied Sciences, and senior author of the paper. Ingber leads a large effort to develop human organs-on-chips — small microfluidic devices that mimic the physiology of living organs. So far Wyss Institute teams have built lung, heart, kidney, and gut chips that reproduce key aspects of organ function, and they have more organs-on-chips in the works. The technology has been recognized internationally for its potential to replace animal testing of new drugs and environmental toxins, and as a new way for scientists to model human disease. To build organ chips, in the past Wyss teams have combined multiple types of cells from an organ on a plastic microfluidic device, while steadily supplying nutrients, removing waste, and applying mechanical forces the tissues would face in the body. But bone marrow is so complex that they needed a new approach to mimic organ function. This complexity arises because bone marrow has an integral relationship with bone. 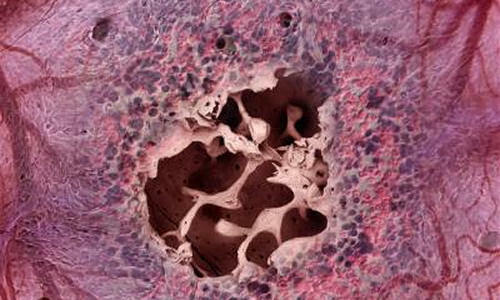 Marrow sits inside trabecular bone — a solid-looking type of bone with a porous, honeycombed interior. Throughout the honeycomb, conditions vary. Some areas are warmer, some cooler; some are oxygen-rich, others oxygen-starved, and the dozen or so cell types each have their own preferred spots. To add complexity, bone marrow cells communicate with each other by secreting and sensing a variety of biomolecules, which act locally to tell them whether to live, die, specialize or multiply. “We figured, why not allow Mother Nature to help us build what she already knows how to build,” said Catherine S. Spina, an M.D.-Ph.D. candidate at Boston University, researcher at the Wyss Institute, and co-lead author of the paper. Specifically, Wyss Institute Postdoctoral Fellow Yu-suke Torisawa and Spina packed dried bone powder into an open, ring-shaped mold the size of a coin battery, and implanted the mold under the skin on the animal’s back. To sustain the engineered bone marrow outside of a living animal, the researchers surgically removed the engineered bone from mice, then placed it in a microfluidic device that mimics the circulation the tissue would experience in the body. Marrow in the device remained healthy for up to one week. This is long enough, typically, to test the toxicity and effectiveness of a new drug. The device also passed an initial test of its drug-testing capabilities. Like marrow from live mice, this engineered marrow was also susceptible to radiation — but an FDA-approved drug that protects irradiated patients also protected the marrow on the chip. In the future, the researchers could potentially grow human bone marrow in immune-deficient mice. “This could be developed into an easy-to-use screening-based system that’s personalized for individual patients,” said coauthor James Collins, Ph.D., a Core Faculty member at the Wyss Institute and the William F. Warren Distinguished Professor at Boston University, where he leads the Center of Synthetic Biology. Bone marrow-on-a-chip could also generate blood cells, which could circulate in an artificial circulatory system to supply a network of other organs-on-chips. The Defense Agency Advanced Research Projects Agency (DARPA) is funding efforts at the Wyss Institute to develop an interconnected network of ten organs-on-chips to study complex human physiology outside the body. The above story is based on materials provided by Harvard’s Wyss Institute, Dan Ferber.